In order to sell Pakistan Steels products profitably and in an efficient manner the following procedures have been adopted under the guidelines of our Marketing Department. 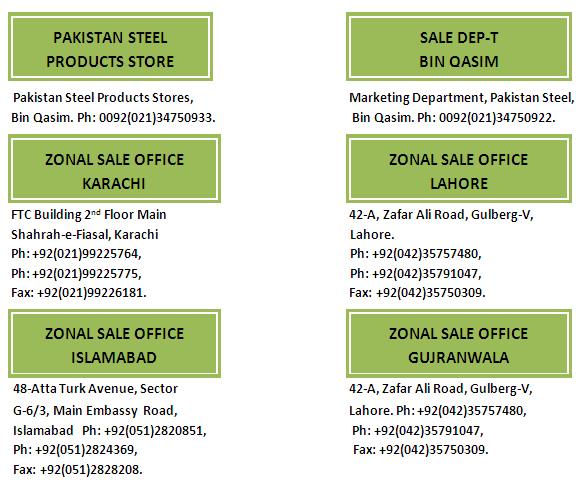 To ensure the smooth flow of our products throughout the country and to acheive on-time deliveries to our valued customers Pakistan Steel has established Zonal Sales officies at strategic cities across Pakistan. The zonal sales offices, incorporating mordern computer facilities to promote sales, provide a one window operation to our valued customers. The available computer facilities have been utilised to provide an "on-line computer system" for the the production, marketing and sales activities. The existing system has been made to work trouble free in this new world of globalisation. Placement of orders by authorised dealers (Traders and Consumers). Signing of the contract with the dealers on varification of the production. Adjustable security amount Rs.50 and Rs.100 per metric ton of the total amount of the contract is received at the time of signing the contract. On receipt of the Product transfer Advice (PTA) for the production needed by Pakistan Steel Product Stores (PSPS), the cleints are issued NORs accordingly to make payment, receive delivery and to lift the material within the stipulated period. The prices prevalent at the time of issuance D.O are charged. Failure to lift the material within the stipulated time makes the dealers liable to forfeiture of the security amount paid at the time of signing the contract at the sole discretion of the seller. In the current sales policy, Pakistan Steel allows 1.5% trader dealer rebate. However, consumers are given priority in allocation of materials against their orders.